What is evening primrose oil? What does it do when we take it? What is evening primrose oil good for? Picture: The evening primrose flower can be pale like a primrose or far duskier. Here is a page about the benefits of taking evening primrose oil and the part that essential fatty acids play in good health. There is a lot to learn about the benefits of evening primrose oil; this article is an introduction to the topic. I believe that it is a supplement which may benefit many people who are searching for better health - and it is entirely consistent with a natural and green living lifestyle. Evening primrose oil is a natural product. For the sake of brevity, I refer to evening primrose oil as EPO in parts of this article. To begin to answer the question "What is evening primrose oil?" we need to first look at the plant it comes from. The evening primrose (Oenothera biennis) is a tall, handsome plant bearing yellow flowers which - as the name suggests - come into their own around nightfall. The plant looks nothing like a spring primrose. Although yellow, the colour of the flowers is often deeper than the pale, icy shades of the spring primrose. The plant bears abundant seed pods which deliver hundreds of seeds rich in an oil with valuable health properties. 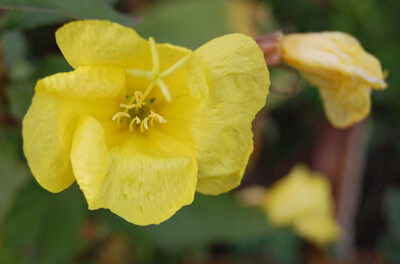 Evening primrose is a native of Mexico and probably migrated northward with tribes peoples. The benefits of evening primrose oil were noticed by North American Indians who used the plant for healing wounds and treating swellings. The seeds arrived in Europe by sea. Soil used as ballast was thrown out near docklands and the plants spread from there. In Britain it is widespread in some areas. The garden plant has rather bigger flowers than the wild variety and is less invasive. In the 1920s some tests were done to determine the nutritional elements of evening primrose oil. Evening primrose burst into the public consciousness in the 1970s. A small firm called Efamol began promoting and testing the effects of evening primrose oil on a variety of complaints. The oil has been grown commercially ever since Efamol conducted those experiments which showed the promise of the oil as a health supplement. So, what are the benefits of using evening primrose oil? Evening primrose oil is rich in GLA - Gamma-Linolenic acid which is a type of essential fatty acid (EFA). Essential fatty acids play a crucial role in our metabolism - essential, as the name suggests! They are in fact foods. Our bodies are able to use the elements such foods provide to maintain health. GLA is used for a variety of roles but in particular it helps the body to manufacture prostaglandins which have a key role in fighting infection and inflammation in the body. Prostaglandins are affected adversely by poor diet, aging and other factors, so it is important to give your body every opportunity to aid their production. EPO helps the body produce a type of prostaglandin that promotes anti-inflammatory and blood-thinning properties in the body. Prostaglandins are made in the body from fats (EFAs) and they have hormone-like effects in that they stimulate and regulate other functions. Evening primrose oil (EPO) is not the only source of these valuable and rare EFAs. You get some GLA in blackcurrant seeds, for example. Other linolenic acids are found in diverse foods such as oils and green leaved plants. Walnuts and rapeseed are good sources of Alpha-linolenic acid (ALA) for instance. There has been much talk in recent years about the benefits of Omega -3 fatty acids. The GLA found in evening primrose oil is also classed as a poly-unsaturated Omega -6 fatty acid. Linoleic acid (LA) and Alpha-linolenic acid (ALA) are classed as Omega -3 fatty acids. The amount of Omega -3 fatty acids in the diet is important because too much Omega -6 fatty acids can cause inflammatory reponses in the body. Our diets have become progressively less well supplied with Omega -3 fatty acids in recent centuries. This lack of Omega -3 EFAs is probably the cause of many of the "diseases of civilisation". One of the main dietary sources of Omega -3 fats is from Eicosapentaenoic acid (EPA) found in fish oils. Although GLA is an Omega -6 fatty acid it behaves rather like an Omega -3 in that it reduces inflammation. What is the difference between GLA and other essential fatty acids? Skip this bit if you want to avoid the technical stuff! These fatty acids are closely related in chemical structure. Both linoleic acid and alpha-linolenic acid are essential fatty acids, meaning that they are foods which we cannot get along without. Our bodies can make other kinds of fats from the building blocks supplied by foods but essential fatty acids have to be present in our diets. Alpha-linolenic acid (ALA) is an Omega 3 fatty acid and as such is very beneficial. It's also found in a range of food stuffs, from flax to rapeseed and hemp. It's also found in some broad-leafed green plants. It is a close relation to GLA (an isomer). Linoleic acid (Note the lack of the second "n" in the name - a source of some confusion!) is an Omega 6 fatty acid. It is found in many vegetable oils, including sunflower and safflower oil and in other common foods such as eggs and walnuts. Shortage of LA can lead to hair loss and poor healing of wounds. It is needed by the body to build GLA. Gamma Linolenic Acid (GLA) is therefore usually well supplied in anyone who eats plenty of the common sources of linoleic acid. However, there may be a good many people in whom the conversion process is defective. The elderly and anyone whose diet is out of balance may not convert enough LA to GLA. The science is complex and still incomplete but there is a strange contradiction that is worth knowing about: GLA has marked anti-inflammatory properties whereas LA actually promotes inflammation. For example, excessive LA in the diet has been blamed for some types of heart disease. Also, excessive amounts of LA may increase the need for Omega 3 fatty acids and GLA. Those of you who are still awake may have noticed that GLA is an essential fatty acid but the body can manufacture it from other EFAs. A seeming contradiction. The important thing to notice is that GLA from EPO provides a short cut to some valuable benefits, some of which Omega 3s may also deliver. What the above means in practice is that anyone who is affected by chronic inflammation - whether of the skin (eczema, acne) or of deeper organs or tissues might be well advised to look at taking GLA (Evening Primrose Oil) supplements, as well as adjusting their diet to contain more anti-inflammatory foods. That's enough of the rather complex biochemistry for now! Here are some details of how GLA from evening primrose may help us. Which problems can EPO help? GLA from evening primrose oil has been credited with helping many women's ailments from benign breast disease to the menopause. Low serotonin levels have been linked to the mood swings of pre-menstrual syndrome (PMS). GLA helps keep serotonin levels high and for this reason it may also be beneficial for others suffering from depression. SAD (Seasonal Affective Disorder), a type of depression affecting some people when light levels are low in winter, may also be alleviated by GLA from evening primrose oil. There is still some controversy over how effective evening primrose oil may be. The British government has licensed it as a drug for atopic eczema and mastalgia (breast pain). However, some studies indicate that its effects are modest. What is evening primrose oil good for? Here is an outline list of the benefits of EPO for various ailments. It is by no means exhaustive. Benign breast disease and Pre-Menstrual Syndrome (PMS) symptoms may be relieved by EPO. EPO may be of some benefit in the menopause, in particular for reducing "hot flushes". EPO has also been used with some success for schizophrenia and for autoimmune disorders such as rheumatoid arthritis. GLA is also being studied as a potential anti-cancer agent. GLA is possibly able to suppress tumor growth and metastasis. Research is on-going. Age-related macular degeneration (AMD) may be helped by GLA and the Omega -3 fatty acids as found in oily fish. ADHD (Attention-Deficit Hyperactivity Disorder) may be improved by evening primrose oil supplements. Obesity: Weight loss may be helped by evening primrose supplementation, especially for people who are more than 10% overweight. A combination of EPA (found in fish oil) and GLA may help atherosclerosis sufferers. GLA may also help prevent high blood pressure. Ulcers of various kinds may be helped by GLA supplements. Allergies may be helped but the evidence is at best inconclusive. People who are prone to allergies may require more essential fatty acids than average or they may have difficulty processing LA to get GLA. Barlean's Organic Oils Organic Evening Primrose Oil is available from Amazon. While the whole of the evening primrose plant is edible and there do not appear to be any cases of poisoning in traditional herbal use, there are still some restrictions on its use as a supplement. Do not take EPO if you are (or suspect you are) pregnant or if you are breastfeeding. Do not take EPO if you are taking anti-coagulants or blood thinning drugs. Do not take EPO if you are suffering from epilepsy. Otherwise, evening primrose oil can be one of the most beneficial of food supplements and can help people suffering from a wide range of ailments. The benefits of EPO outweigh the cautions by a long way - but moderation is always a good idea! The caution regarding pregnancy seems to stem from an idea that epo could induce early labour because it may affect the cervix. Some epo is also combined with fish oil, which also can give rise to concern for women during pregnancy. Some women take epo in late pregnancy as an aid to a good delivery. Consult your midwife or other health professionals for personal advice. As regards epilepsy, the general advice given by medical professionals is that epo may promote seizures. However, there does not seem to be much evidence for this view. I include the advice here on the precautionary principle; there are other ways to access the benefits of epo, after all. Fish oils and other sources of GLAs and EFAs can be explored, for example. The benefits of evening primrose oil are perhaps best obtained when it is used as a supplement in an already excellent diet. In other words, it is best not to treat it as a drug or a universal panacea. Use evening primrose oil carefully, together with a sensible, healthy diet and you should get good results. It is always best to consult a physician if you are suffering from anything other than minor complaints. I hope you have found enough information on what is evening primrose oil. For more on evening primrose please also see Evening Primrose Uses and Benefits. Why Take a Good Vitamin and Mineral Supplement?.